Small birds are tricky to photograph. Something the size of, say, a Golden Eagle gives a photographer a fighting chance, especially if it sits still, stares at you and says, “aren’t I pretty – why not take my portrait?” [Ed: Dream on, I think.] Even with a relatively powerful lens (mine’s a 400mm), you have to get damn close to a modestly small bird to make the picture worthwhile. 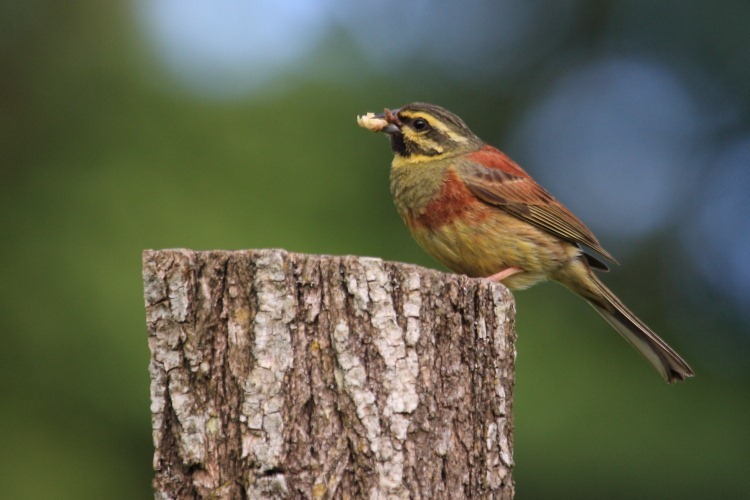 One example of a problematic small bird might be a Cirl Bunting (Emberiza cirlus). “That’s a curious example to choose”, I hear you mutter. True enough, except that a Cirl Bunting happened to be flying around our campsite at Réalmont catching insects. Every now and then it would alight on the fence behind our pitch, either on the post or the wire, with a beak full of ex-insect. It was a male and, since we didn’t see a female, we assumed the male was engaged in feeding his mate while she was incubating eggs. Quite a colourful little character, don’t you think?